With December fast approaching, many of us will be decorating our homes for the festive season… but what can we do when there isn’t enough space for a traditional Christmas tree? 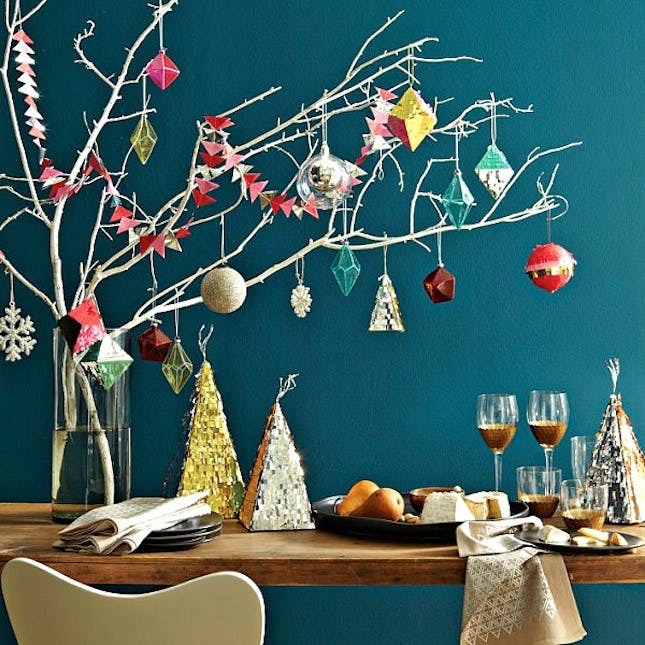 Try one of these creative Christmas tree ideas instead, of course! You can ditch the tree when fairy lights and ornaments alone look this good! 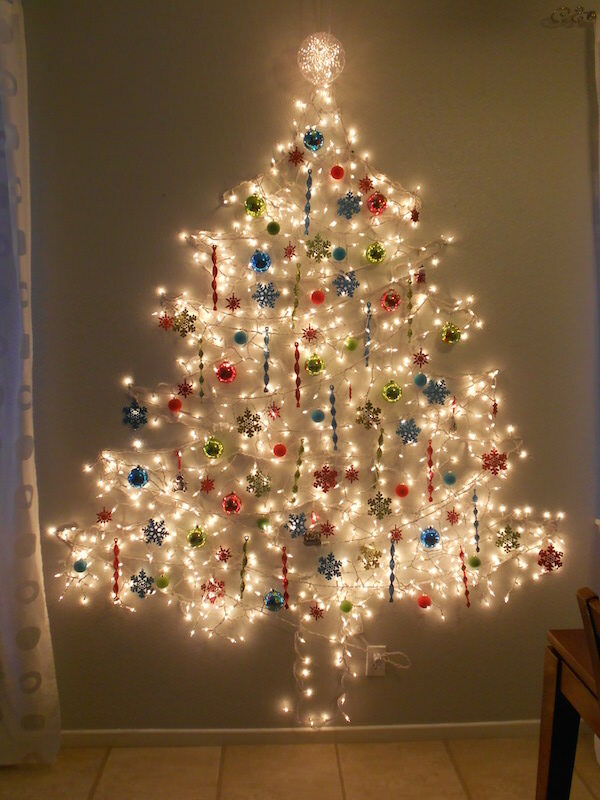 Using removable adhesive hooks and tape, this non-traditional Christmas tree is jaw droopingly good! 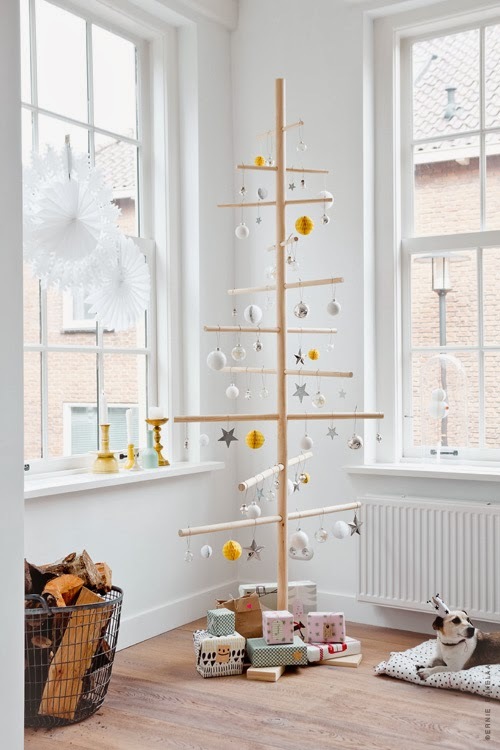 So Scandi and so stylish, it’s hard not to love this simple dowel Christmas tree by Jelanie Shop. The design of this tree is quite straight forward so it could make for a fun DIY project! Another minimal Christmas tree idea is to use two pieces of plywood cut into Christmas tree shapes and slot them together to make a 3D plywood Christmas tree. One of the best things about this Christmas tree is it can be disassembled and packed away flat until next year, taking up next to no storage space too. 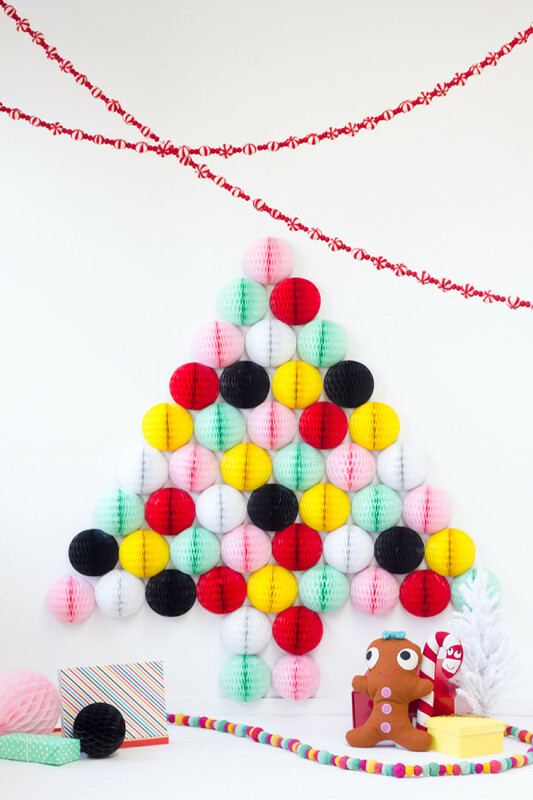 For those of us who love a bit of colour, this DIY honeycomb Christmas tree idea by Studio DIY is such a fun idea! These paper honeycomb balls (sold flat) can be found in most party stores and in the party section of large department stores like Kmart. 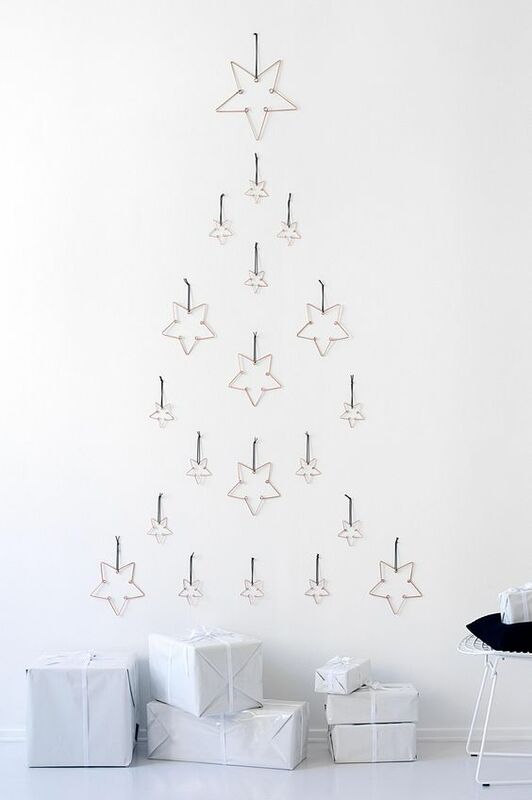 Similar to the fairy light Christmas tree above, this Christmas tree uses adhesive wall hooks to create the geometric string design. You could hang light ornaments from the string or the hidden clear hooks, or you could peg Christmas cards and other decorations to the string. Ok so not technically a Christmas tree but it is very Christmas tree inspired! 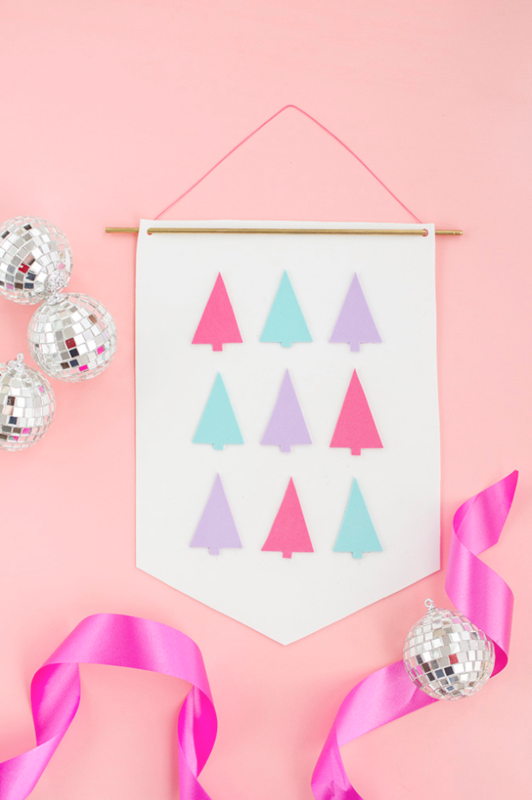 We included this banner Christmas tree idea because it’s so colourful and quirky AND a great option for those of us who are seriously short on space. Find the DIY to make it on Dream Green DIY blog here. 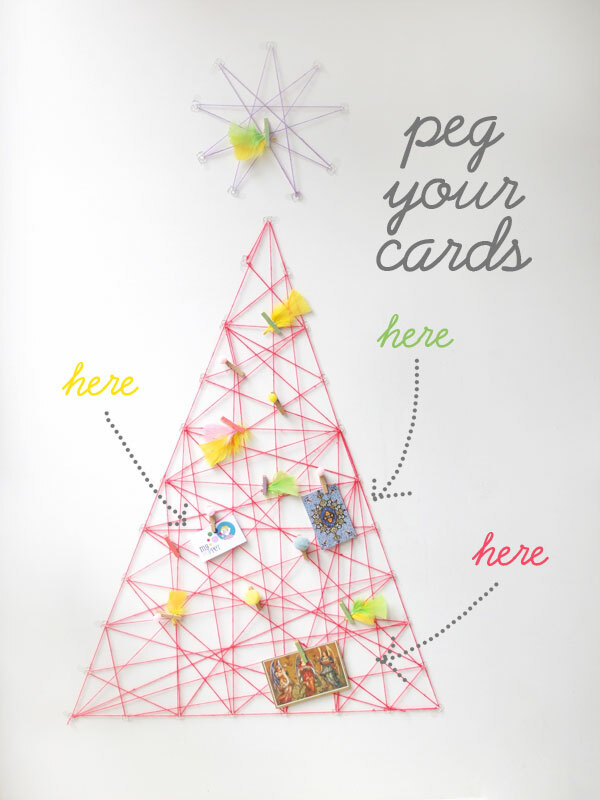 A simple and no-waste Christmas tree idea is to simply blu-tac Christmas cards in a tree shape onto your wall — a great option for those of us who still receive paper cards that is! 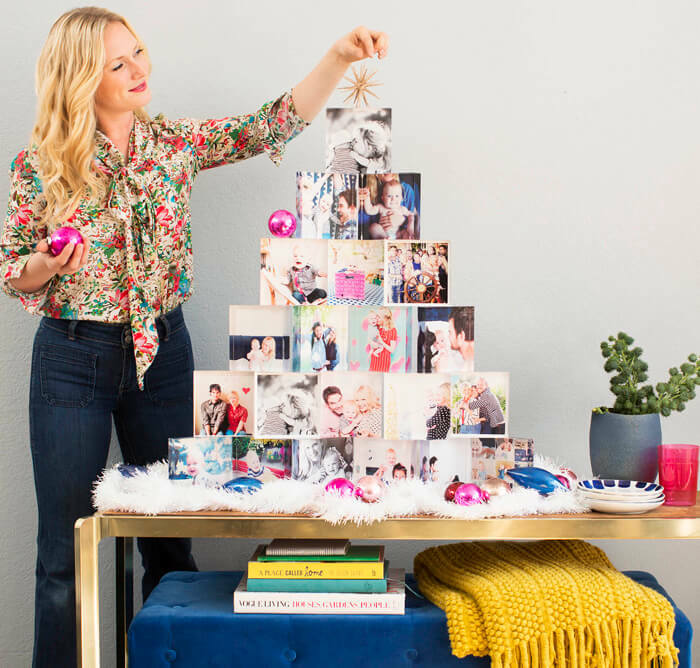 It doesn’t get any quicker, easier or more affordable than this — a washi tape Christmas tree or cluster of Christmas trees as Brit + Co have done! You could use any colour tape you like or even mix in some gold or other metallic colour for added wow. And the types of tree shape you could make are endless with three ideas shown below. 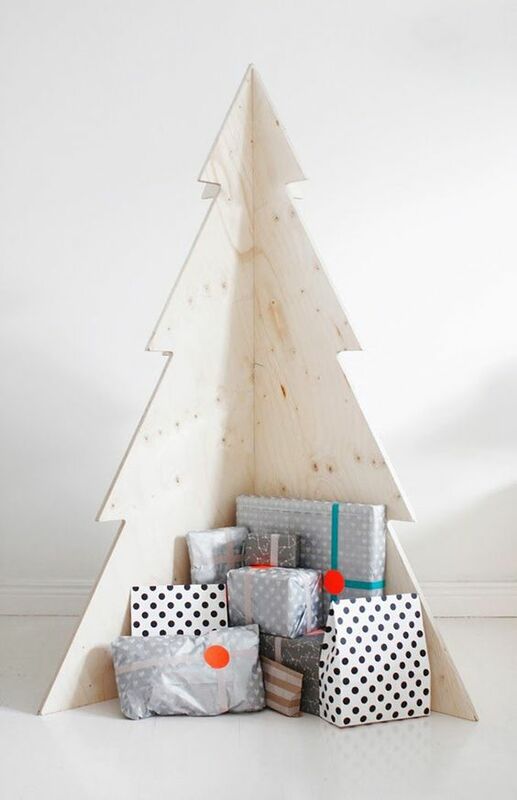 We love this pallet Christmas tree we designed — it’s simple, stylish and so affordable to make! 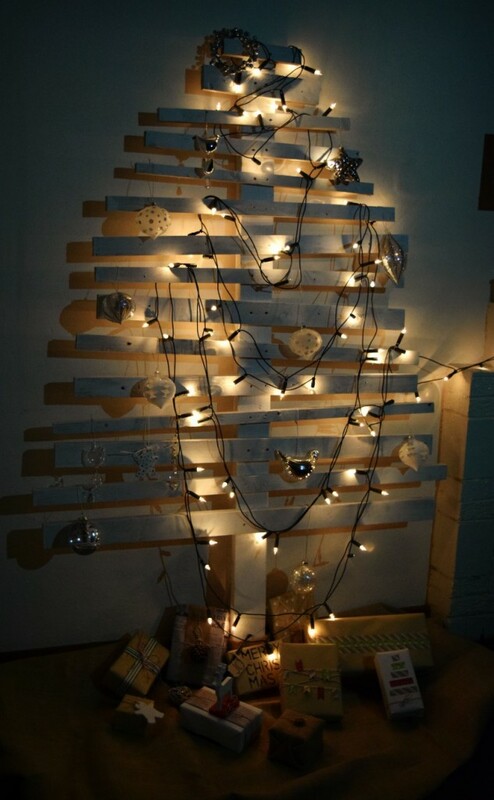 Using just one piece of timber as the trunk and a few planks of pallet wood, this pallet Christmas tree can be customised to whatever size you like. It’s great for small spaces, taking up just a small amount of floor space and doesn’t need to be drilled into the wall or hung so it’s also a great option for renters too. Talk about a sweet and personalised Christmas tree idea! One of our favourite designers, Emily Henderson, made this modern Christmas tree by stacking acrylic blocks with family photos on the face. There are loads of printing services that offer digital prints in a flash which you could mod podge onto acrylic or timber blocks to make your own version of this tree. 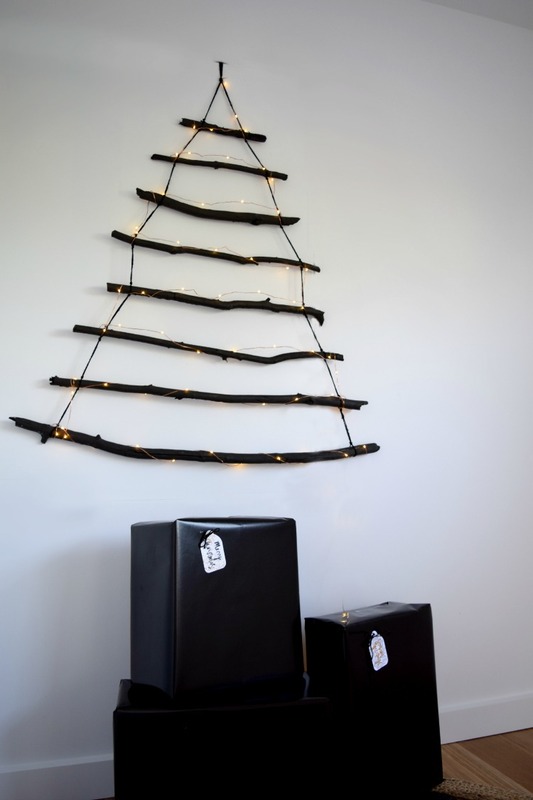 Another fun Christmas tree alternative we came up with is this branch Christmas tree. It can be hung on a wall or over a door, and decorated with just some simple string lights as we’ve done or loads of decorations. This DIY branch Christmas tree will cost just a few dollars to make and is a great way of bringing a more natural feel to your Christmas styling. A different take on a branch Christmas tree is to place branches in a vase on your dining table or mantle and add decorations. 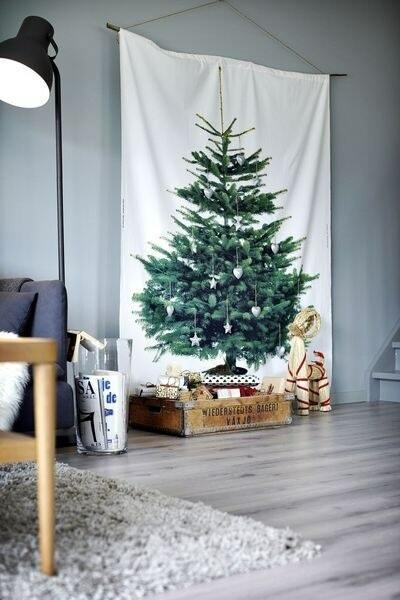 This DIY Christmas tree idea literally takes up no floor space and makes for a stunning focal point in any room. 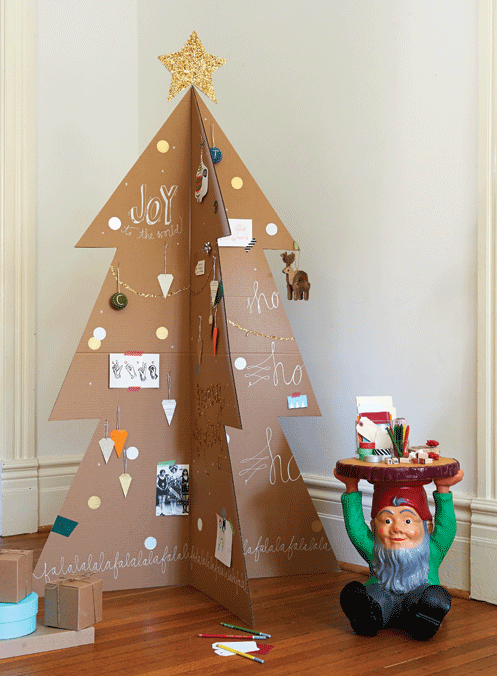 Using a similar principle as the ply Christmas tree above, this cardboard Christmas tree is a more affordable and perhaps you could say more ‘beginner level’ DIY Christmas tree. You can find the instructions to make this Christmas tree on the Chatelaine blog here. 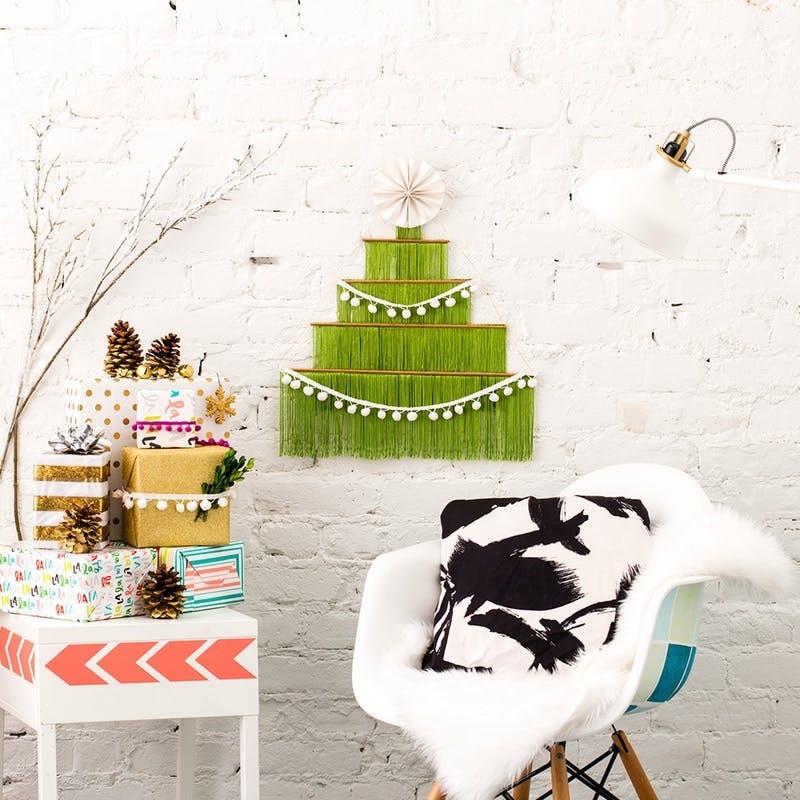 Another wall hanging idea is to simply use fringe and pom pom trimmings from your local craft store to make this chic Christmas tree. Love the idea of positioning a table for gifts and cookies for Santa close by too. If the small colourful banner above didn’t cut it for you, perhaps this oversized wall hanging of a Christmas tree will?! This ultra minimal Christmas tree of ornaments tacked to the wall in a tree pattern is sooooo divine — proving less is often more! 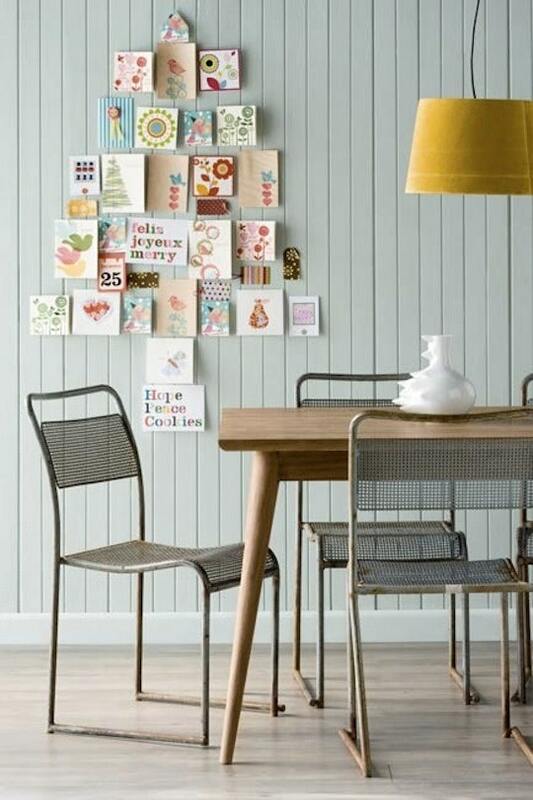 If putting adhesive hooks on your walls isn’t an option, you could try using a large canvas instead. This large canvas has pine branches and ornaments glued to it but you could create almost any of the Christmas tree ideas we’ve shown in this list, like the string Christmas tree or ornament Christmas tree too. 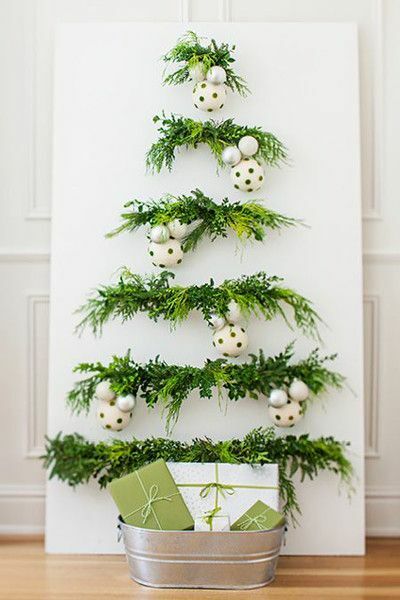 Have you found a space saving Christmas tree idea on this list for your home? 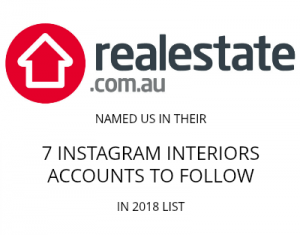 We’d love to know your fave by commenting below!